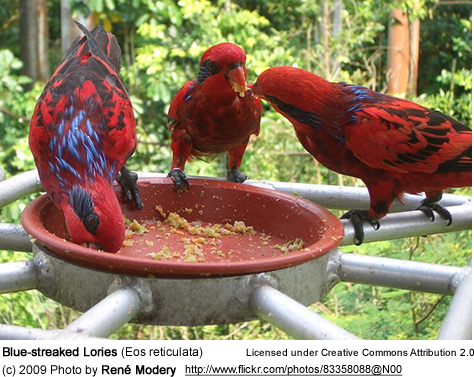 The Blue-streaked Lories (Eos reticulata) are endemic to the Tanimbar Islands in the Maluku Province in Indonesia. 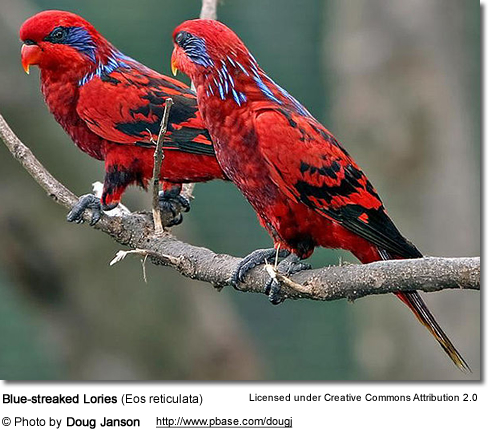 These parrots were also introduced to Barbar, Damar and Kai Islands; however, may again be extinct on these islands. Within their range, they inhabit mangroves, forests, coconut groves and plantations. These energetic and social birds typically travel in flocks and use their nests for roosting throughout the year. 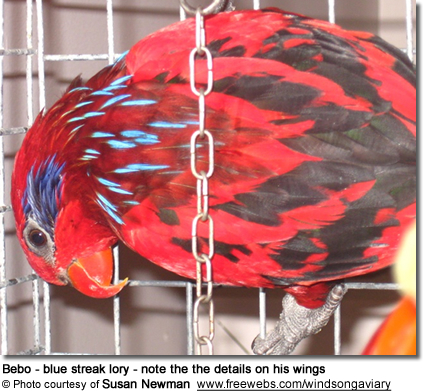 These affectionate birds are popular pets which puts them at risk of extinction, as adults are commonly caught for the illegal pet trade, and chicks are taken from their nests. Laws are in place, but enforcement presents challenges. Due to their critically endangered status, birds should be allowed to remain in their natural habitat. Those that cannot be released back into their native range should be placed into a well-managed breeding program to ensure the continued survival of this species. 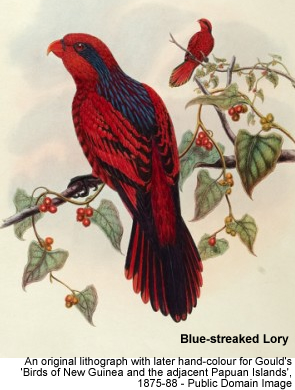 The Blue-streaked Lory is a medium-sized parrot that measures about 12 inches or 31 cm in length (including the long tail) and weigh between 5.1 - 5.4 oz (145 - 155 g). black markings on the wings. 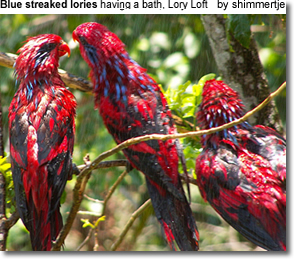 Like other lories, they have unique "brush" tipped tongues that evolved for their staple diet of nectar and fruit. 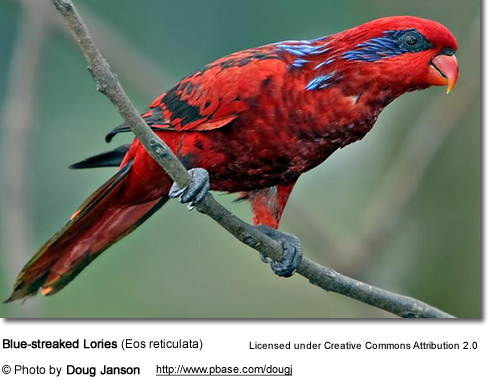 Adults have orange-red eyes and red beaks. Juveniles resemble the adults; except the plumage below is dusty black / blue edged. The blue mottling on the mantle of the adult is replaced with streaks in immature birds. The bill is orange / brown and the eyes are brown. 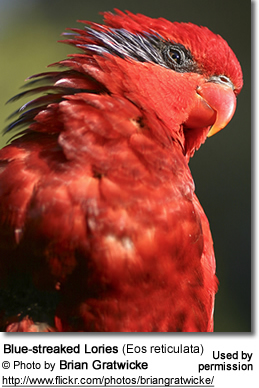 The voice of the Blue-streaked Lory is usually softer than other parrots, except when alarmed or bored. Their voice ranges from prolonged, loud, piercing whistles and metallic "pings" to soft, high-pitched warbles and chattering. Their calls are reminiscent to the starlings' chatters and whistles.